Nickole Brown’s books include the collection of poems Fanny Says (BOA Editions, 2015), Sister, a novel-in-poems (Red Hen Press, 2007), and the anthology Air Fare: Stories, Poems, and Essays on Flight (Sarabande, 2004), which she coedited with Judith Taylor. She graduated from the Vermont College of Fine Arts and was the editorial assistant for the late Hunter S. Thompson. She has received grants from the National Endowment for the Arts, the Kentucky Foundation for Women, and the Kentucky Arts Council. She worked at the independent literary press Sarabande Books for ten years. Currently, she is an editor for the Marie Alexander Series for Prose Poetry at White Pine Press and was the National Publicity Consultant for Arktoi Books. Nickole has taught at the University of Arkansas in Little Rock, where she continues to live. 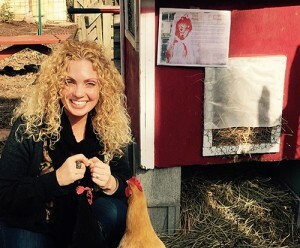 She continues to teach at the low-residency MFA program in Creative Writing at Murray State. 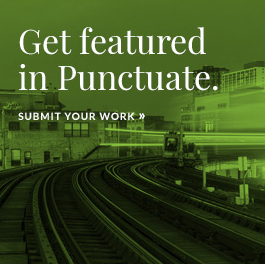 Punctuate. A Nonfiction Magazine: Fanny, the narrator’s grandmother in your book, isn’t always portrayed as ideal. Were you ever tempted to leave out negative traits about her? Nickole Brown: There are some things that are left out. But I left them out because I thought they were just too personal. I always think that if you’re going to write about anyone, including yourself, you’ve got to think of them as a persona. And no one is all victim and no one is all hero. We’re all just this messy little knot of good and bad. And Fanny was no different. That didn’t mean that I loved her any less. The section I had the most trouble with was that third section and that deals with her racism, which is very, very hard to explain and also is something that shames me so deeply. I do believe that when you write something that does make you uncomfortable, if it embarrasses you, or if it makes you hot with shame, if you can find a way to write it that is somehow free of self-pity or judgment, then truth will find a way to stand on its own two legs. P: Throughout the book, Fanny’s very present in her terms and phrases. How were you able to tell this story in your grandmother’s voice without making a caricature of her? NB: That was a real struggle. The caricature thing I really, really wanted to be careful about. I didn’t want her to grow into some kind of a two dimensional funny lady, right? Which brings me back to writing in the darker stuff. Because I think if I just left those poems in, just the funny poems or the ones just about the particular way she dressed or the way she threw around all her F-bombs, all that, that there’s a lot more to her. I wanted to make sure that all of her was present. P: Fanny Says has been described as an “unleashed love song” to your grandmother. What is it about family-centric, autobiographical material that draws you? NB: I think I’ve always written from the inside out. There were things that were whirring inside of me that could only be addressed by reaching out and communicating with an “other.” In Fanny Says, I was wrestling with coming out, which is addressed in the last section of the book. I was also thinking about the legacy of racism in my family and . . . there’s a lot of things that I love about my family and there a lot of things I’m very, very conflicted about. And so I could then turn to Fanny and even though those poems aren’t all necessarily epistolary, it was a way for me to examine things that I was carrying with me. P: When you’re writing autobiographical material, are you thinking about how your family is going to react to it or is it an afterthought? Do you tell them that you’re writing about them? NB: I talk to my Mama a lot. I talk to my Mama every day on the phone. With Fanny Says when I’d finished the book I sent it to her and I sent it to her sister, who is Fanny’s oldest, and both of them called me and said that I had gotten the story right. And I don’t think I was necessarily looking for their approval in terms of, you know, “Are the poems good or are they bad, or do they portray Fanny in a good light or a bad light?” I just wanted to make sure I had the facts straight, that what I remembered somehow aligned with their memory of her, too, because Fanny was different. It’s interesting because I thought that when a lot of my family read the book that they would have some difficulties with it. And some of them took awhile to get back to me. They said that when they got the book in the mail that they didn’t want to read it, and they felt very reticent about it, but then once they read it, they felt that that was their Mama. P: Once your work is published, your family members, especially Fanny, become characters in the reader’s mind, and they no longer fully belong to you. She is no longer only your Fanny. How do you deal with that as a writer? NB: I think it’s awesome. I feel like there’s a small way in which maybe she’s not forgotten. That was my biggest fear, that there was this absolutely amazing force of nature that was going to disappear with me, or with my generation, because all the kids born in the family after me, they don’t remember her. In terms of people outside the family, I think that anytime that you publish something, it is no longer exactly yours. These poems continue to have a life. So, if anything, the real risk for any poet is that you’ll write something and no one will take ownership of it. So, anytime somebody wants to take ownership of a story or a poem that I have written and it lives on in them, in some small way, there is really nothing that makes me feel better. You know, the memories that I have of Fanny, the love that I have for her, that doesn’t fade. This is just a little tribute that I made in her honor, this is the best of her story that I can get on the page. P: Can you talk a little bit about how you were able to gain the distance to talk about such heavy subjects, about your family, while also turning it into art? NB: Lots and lots of revision. In that same vein, distance is very, very important. If you were to look at some of the very early drafts, and by drafts I mean journal entries, some of them going back ten, twelve years before any poem was ever formed, there was something very, very different. It was just this raw and sort of . . . material from my life and I needed enough distance so that I could hammer it out, so that I could think about craft, so that I could start to think about line breaks and syntax . . . how can I turn this into a navigable sentence? So it’s just a lot of pressure-cooking and a lot of time. A lot of time. P: Why was it important to you to capture southern life and culture? Do you consider yourself a southern writer? P: This is a kind of switching gears, but I’m curious about the actual composition of the book. What prompted you to break it up into separate parts, separate sections? Why did you choose to organize it like you did? NB: What you have here are different threads, OK? So, you have all of the pieces that are the “Fanny Says” sections. Those are all prose poems, those are exclusively in Fanny’s voice. And then there are other threads. There’s the linguistics thread. Those poems, in particular, are poems in which I’m trying to suss out the way that she spoke, how she spoke, where it came from, and what were the implications for our family. So literally I’m trying to deal with the southern dialect and how it lived, as a presence, in her house and was a part of our culture. And then I have other poems in there you’ll see that are sort of totems. These are things that Fanny would find herself buying; Pepsi, Clorox, Crisco (God help us), Phenobarbital, right? And those poems are the result of . . . if I sat down to write about Fanny, as a person, I realized I couldn’t do it. I felt too responsible to her. But I could write a poem about Crisco . . . I could write a poem about Pepsi. I literally could research these things and understand them and then let her story come through them. So then there were those pieces, right? I spent, like, three days researching Pepsi. You know, you wouldn’t believe, right? Or Norell . . . looking at the components of Norell, what’s in that perfume. So, I have all these threads. What I did was . . . I tried to put them in an order that would carry the reader from the first page to the last. Meaning what does the reader need to know first? How can her story accumulate as the poems moved on? I wanted to have a balance between her voice and my voice. I also wanted to keep the pace, meaning that if some of the poems were too heavy-handed or had gotten, deep or sad then I wanted to pull it back up. For those of you who are old enough in the room to have any experience with a mix tape, it takes skill. I’m gonna start ‘em off slow and . . . right? It’s the same thing. You also want to make sure that the order doesn’t confuse people, that you don’t give a fact or some kind of logistic that your reader isn’t prepped for, that they’re not ready for, and you want to think about the arc. P: Do you want to say something about how or why you moved from fiction to poetry? Could you just talk about how fiction influences poetry and how you moved from one to the other? NB: Well, I think, truth be told, I probably should have studied creative nonfiction. Because, even now, I’m not writing from my life right now, but I’m writing from research. And, in fact, I am someone who very much enjoys the “true” story, the real story. My memory is a scattershot of bits and pieces and a lot of black space in between. And not just in times of difficulty or trauma, the way that I remember things is fragmented. Very, very fragmented. I found that poetry could hold that. There are things that you can do, in poetry, there are things that you can do with the white space, the blank space, the tension between the fragments, that to me, is much more representative of what I have in my own mind. Of the work that is in my mind. P: You had to do research on your family for both of your books, how do you balance what is factually correct and what is emotionally honest? NB: I just look for the truth. I don’t know exactly how it is that I find it, or even if I have found it. I gave it a good try. What I try to do is put it up to the litmus test of, Is what I am writing authentic? That might be a better word for the truth, actually. I just try to make sure that what I am writing is authentic. Grace Paley once said, “Good writing is scrubbed free of all flaws.” But there is that emotional truth, and sometimes, your emotional truth can get in the way of the factual truth. You have to back away from that as much as possible. It is a really hard balance. P: Can you talk a little bit about how you teach and write at the same time? How do you meld the two? NB: Here is what teaching will do for you; it will keep you close to the page. You will have to go into the classroom and every time you step in front of those students you will have to articulate what about writing matters the most. That is part of learning for yourself. It is a lot of work, a lot of good work. My students were largely first generation students, commuter students, students who had a baby or two, a job or two, and they were just trying to make their lives better. Creative writing, poetry, it mattered to them. When I saw how hard they were working, I sure as hell knew I couldn’t go home after a whole day and say, “I’m just going to watch ‘Downton Abbey.’” Because I knew they were going home feeding their babies, giving them their bath, putting them to bed and then sitting up and writing and working. In terms of the academic life, the summers are where it’s at. If you are doing your job, you will get some writing done during the semester, but if you are like me, it won’t be a lot. I take a lot of notes during the semester, if you plan your classes accordingly, you will get a lot of good reading done, during the semester, deep reading. A lot of times, I would assign books that I wanted to understand. I would often start class and say, “This belongs to you, and I’m not teaching you anything that I don’t have questions about myself, so help me understand.” The semester was a period of growth and introspection and thinking. The holidays were where I would get my writing done. P: You mentioned that your students are a source of motivation for you, when you are going through these dips and lulls, what do you do to start writing again? NB: I remember my days waiting tables. That always helps. You just have to do it. You just have to show up like you were punching in a card. Realize that the rest of the world works just as hard, if not harder, than you do. And you are coming out of this without varicose veins and your hair doesn’t smell like pickles. P: What is your feeling about the difference between inspiration and the muse? NB: Well, I think it is the same thing. It is when you’re tapped in, when you are gifted a paragraph out of the ether, and you can hardly type fast enough. That has happened to me, once or twice, in my life, but it has never happened unless I was present and aware and actively receptive. It’s not like I was running to Target, cleaning the house, grading papers, talking to my mom on the phone and was like, “Hey, here’s a poem!” It doesn’t happen that way. You know those artists retreats you can go on? I often feel like I am trying to woo back a woman that I ignored for a long period of time. Like “I’m really sorry, baby. You’ve been wonderful to me. I got this cabin, in Michigan, no one is going to be there but me and you. I got some books for us.” And then I just wait for her to come back. And sure enough, when I get to that cabin, I will have four or five days of pacing and tearing out my hair and ripping at my notebooks, thinking “I am worthless.” But if I sit there long enough, the muse will come back. It feels like the muse takes pity on me, like, “here, take a line.” Inspiration follows work, but there might be those blessed few out there, who actively receive, work all of the time. But I am a workhorse. I come from a working class family. Writing has never come easy to me. P: If it is not easy, then why writing? NB: It’s the only thing I’m good at. When I don’t write I don’t feel like myself. The joy of writing, for me, has been that I don’t have the answers. I tried before to write about things that I have already figured out, but they always kind of fizzle. I often have a lot of ideas for poems, or for collections, but you know when you hit one that taps into one of your obsessions. That taps into something that you maybe need to investigate, some of the most important things are to make sure the topic you pick, you have a lot of very pressing questions about. So don’t feel as if you need to come to your book an expert on what it is about. That’s the thing to keep in mind too; everything that you need to write about is probably already within you. You know you carry your obsessions, you carry your memories, your interests . . . whatever it is. But the gifts that come back to you are kind of amazing.